Both Wendy's and Arby's debuted new signage on Howell Mill Road this week. Dublin, Ohio-based Wendy's completely renovated their existing restaurant on Howell Mill Road. The new "Image Activated" restaurant sports the chain's new logo, modern exterior and contemporary dining room with a faux fireplace and a more inviting seating arrangement. Wendy's has not closed many metro locations recently, but will likely have to close (with hopes of reopening nearby) their Buckhead location on Peachtree Road. As I mentioned earlier this year, PNC Bank intends to build a new branch on the site of the current Wendy's given the bank is willing to pay much more than Wendy's can. 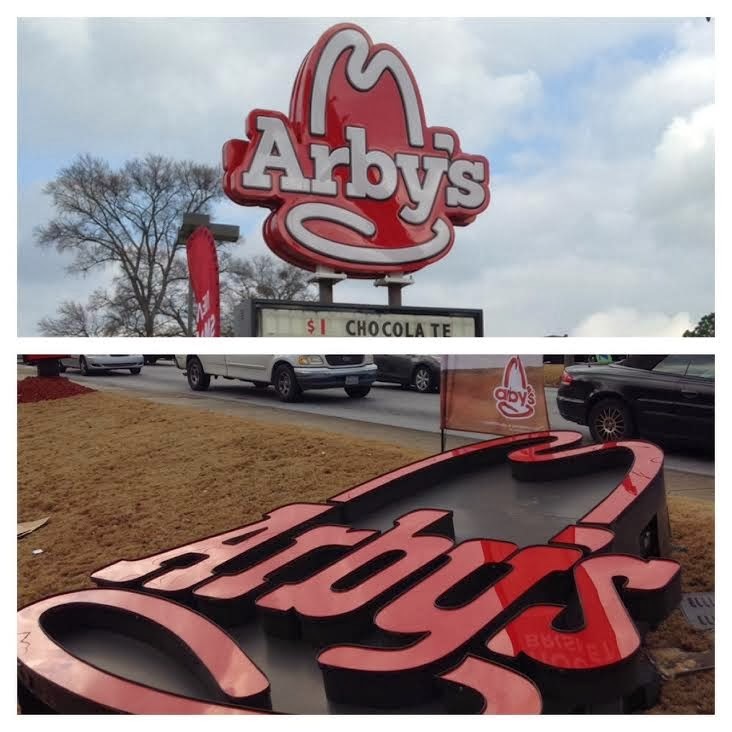 Atlanta-based Arby's boasts a smaller, yet still significant change in signage. 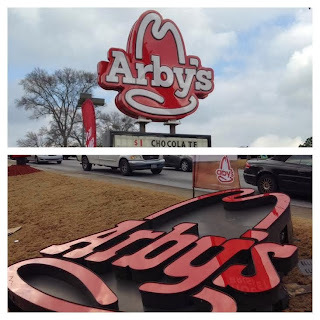 The new Arby's signage replaces what what was already a new logo, introduced last October.  The new logo brings back the capital "A" and has a more modern typeface and a normal-looking apostrophe, rather than the former, which seemed stylized to look like a meat slicer. Last year, the company replaced its slogan "It's Good Mood Food" with their current slogan "Slicing up Freshness." Arby's has seemingly been heading in the opposite direction of Wendy's, with a number of Arby's closing around town and industry chatter that the chain is having identity problems. Recently, I mentioned the Arby's closure on Spring Street in midtown, but the chain has also closed locations on Savoy Drive in Chamblee and also on Jett Ferry Road in Dunwoody. Longer ago, Arby's also vacated freestanding locations on Roswell Road in Sandy Springs and on Buford Highway in Duluth. Arby's was also previously in both the Lenox Square and Northlake Mall food courts, as well as a freestanding location near Northlake Mall that sported the classic, gigantic illuminated cowboy hat. 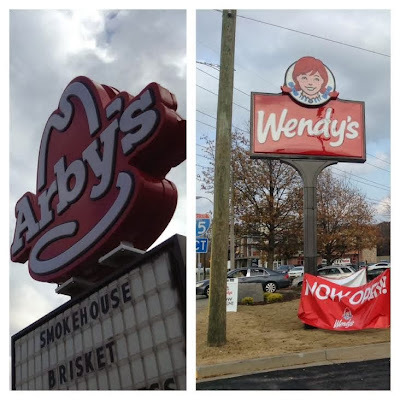 Wendy's merged with Sandy Springs-based Arby's in September 2008, but during the summer of 2011, amidst difficulties in creating synergies between the two brands and executives seeing more growth potential for Wendy's, Arby's was sold. Arby's was purchased by Atlanta-based Roark Capital Group through their restaurant subsidiary, FOCUS Brands. 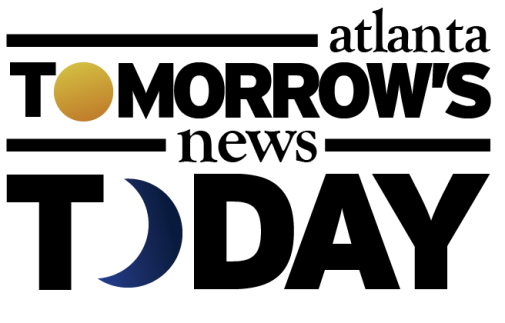 Focus, based in Sandy Springs, is the corporate owner of Moe's Southwest Grill, Auntie Anne's Pretzels, Carvel, Cinnabon, McAlister's Deli and Schlotzsky's Deli. Although Wendy's and Arby's are no longer under the same umbrella, their recent changes have been timed so close together one might think they were still married. Personally, I like select menu items at both. Which do you prefer, if either? Please share your thoughts below. Once in a while I go to the Wendy's at North DeKalb Mall. 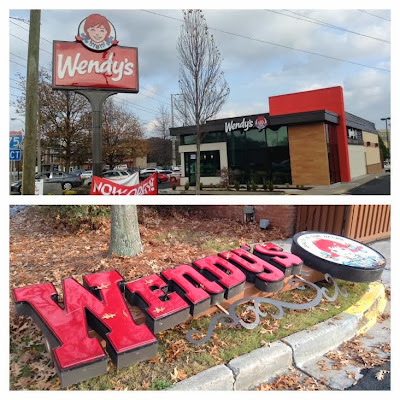 The Wendy's at North lake Mall closed this past year. Use to go to Arby's a lot but I think their quality has gone down. Another recent Arby's closure is the location on Club Drive near Pleasant Hill Rd in Duluth. This was also another sudden closure. The Arby's location on Sidney Marcus has also gone through yet another remodel, the third in 9 years. The manager was joking that they have had the counter at all three possible locations in the front of the store and that the next time they will have to gut the place if they want to try it in a different direction. You'll notice there that the dining room has never really been updated other than paint. Just the counter/service area and kitchen have been moved. I was unaware of the Pleasant Hill closure, thanks for noting it. As for Sidney Marcus, I totally agree! As you recall, it was built as a Market Fresh store then changed, then changed again, this time leading to yet another new counter location. Am I gonna go more if the counter is here versus there? No. Thanks for the comments and readership, I appreciate it.